With the help of Right to Information (RTI), the common man not only has the right to know, but also the right to question those in power. This is the foundation of democracy,” said prime minister Narendra Modi at the tenth anniversary celebrations of the Central Information Commission (CIC) in 2015. Come 2017, and the very tenet stands questioned. The commission is expected to help the country usher in transparency, but it stands accused of doing just the opposite. For example, in March, the CIC rejected an RTI application seeking documents pertaining to Modi’s passport application. Surprisingly, this was the third time the commission did so. In January, it had refused to order the prime minister’s office (PMO) to reveal information about the cost of PM’s foreign travel, citing “important security concerns”. A little before that the CIC divested information commissioner (IC) Sridhar Acharyulu from hearing matters related to the Delhi University and the human resource development ministry after he gave orders for the inspection of university records for the year in which Modi is said to have graduated. As a result, today, the statutory body stands at the intersection where RTI meets limits of the interests of those in power. Its orders are often controversial even when it does not involve a personality like the prime minister. For example, its unimplemented directions in the case seeking to bring national political parties under the ambit of the RTI Act. But there is no end to the commission’s predicament in disposal of cases, refusal of public authorities to be under the purview of RTI or its orders being challenged in the court. The road is not at all smooth for the commission. 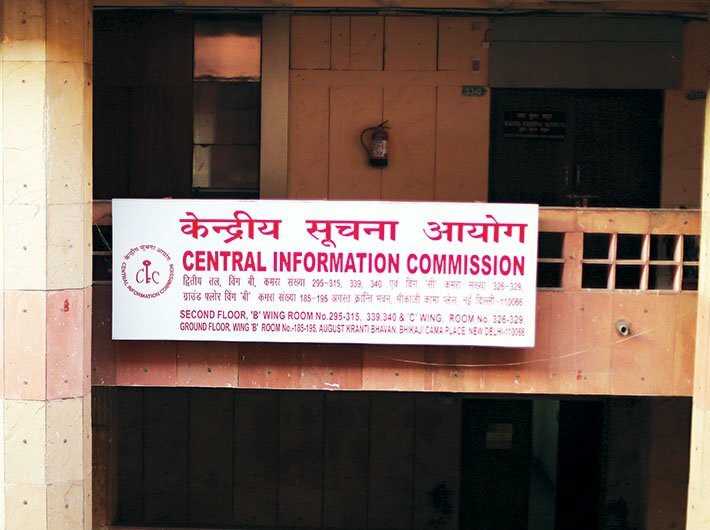 As the RTI Act came into effect in 2005, the CIC was set up at the national level – along with similar commissions at the state level – providing a mechanism to put the new right into practice. Citizens can approach CIC, when they cannot submit an RTI query to any particular government department because of non-appointment of a public information officer (PIO), when PIO denies information, when a public authority fails to provide information in the given time period, when high fee is charged or when they are dissatisfied with the information provided. The commission has a chief information commissioner and ten information commissioners (ICs). Each commissioner is allocated the responsibility of handling queries from more than a dozen departments and ministries. In all the cases, the CIC and ICs give information by inquiring into the matter and exercising all powers vested in them. For this, they can summon officials, inspect documents, receive evidence on affidavits, ask for any public record or copies from any court or government office, initiate an inquiry and even penalise the PIO. At room number 340 in August Kranti Bhawan, the CIC’s headquarters in New Delhi, chief information commissioner (CIC) Radha Krishna Mathur, a seasoned IAS officer whose last posting was in the defence ministry, once in a while looks at the wall clock. A stack of files for today’s cases is neatly placed on the table. Mathur will handle the cases of state-owned telecom company, Bharat Sanchar Nigam Limited (BSNL), for the day. The moment the clock strikes 10.30, someone connects the big TV set in the room with some wires and cables. And soon a link is established with another system in Pratapgarh, Uttar Pradesh, for video-conferencing. Meanwhile, an official, sitting besides Mathur, gets ready with a paper and pen to jot down notes during the hearing. Jeet Lal Maurya from Pratapgarh appears on the TV screen. He complains to Mathur that BSNL has refused to provide him information on tenders related to hiring manpower. Surprisingly, no official from BSNL is present for the hearing. After patiently listening to Maurya’s grievance for 15 minutes, Mathur issues a show-cause notice to the BSNL and sets the next date of hearing after 15 days. The next case related to BSNL comes from Khargone, Madhya Pradesh. A quick connection is made, but neither the respondent nor the appellant appear on the TV screen. After waiting for them for 10 minutes, Mathur issues show-cause notices to both. After Madhya Pradesh, the commissioner is connected to Tamil Nadu. This time both the parties are present. The complainant from Madurai tells Mathur that he had let out his property to BSNL but the company has not paid the rent since 2011. So, the complainant wants monthly rent details from the company. Mathur gives him all the necessary guidance to get the information, but he seems dissatisfied. In a subtle tone, Mathur then tells him that the CIC only helps get information and cannot pass judgments. And that the petitioner should approach a civil court for property disputes like this. In the next five minutes, the CIC is connected to Bareilly in UP. A complainant says BSNL has denied him information stating that it had lost the relevant files. Terming the request of the complainant as legitimate, Mathur orders BSNL’s chief PIO to reconstruct the record in 15 days, and, in case the information is not recovered, fix the responsibility. The same routine continues for the rest of the day. Mathur, on average, spends around 15 minutes on each case and quickly moves to the next one. Around 100 cases per commissioner are cleared in a month. Like most national commissions, the CIC too has been struggling as it has fewer people on board than required. With the retirement of ICs Basant Seth on February 17 and MA Khan Yusufi on December 31, the CIC is now working with only eight ICs. In an RTI query filed by Commodore (retd) Lokesh Batra, a prominent activist from Noida, the department of personnel and training (DoPT) stated that it had received 225 applications for the vacancies. It, however, did not reveal the names of the applicants and the screening committee members citing disclosure of information is exempted under RTI Act, 2005. Batra, though, argues that the information requested doesn’t fall under the exemption clauses. What should happen is that requirement for the commissioner should be flagged off, taking retirements into account. This recommendation should go to the DoPT. The process should start six months before the retirement. Agrawal, one of the activists who have joined the RTI movement with missionary zeal, suggests adopting a system whereby commissioners at the CIC may become the chief commissioner according to their seniority for one year. “In case any senior most commissioner cannot complete one year as CIC due to his/her retirement age, then the next senior most commissioner may be given a chance. Short-term CICs are a liability on the system as they devote much of their tenure in availing LTC (leave-travel-concession), utilising remaining leaves and attending conferences, which leaves only a few days for sitting at the chair of CIC,” he says. Consequences of the poor staff strength are reflected in the huge backlog of appeals. Till April 1, 2016, a whopping 34,982 cases were pending with the CIC. The commission disposed of 28,188 appeals and complaint cases in 2015-16, while it registered 25,960 new cases the same year. The failure to give time-bound decisions further adds to this number. After an RTI plea is filed, the public information officer (PIO) has 30 days to respond. If he/she fails to respond or the applicant is not satisfied with the reply, an appeal is made to a senior officer – the first appellate authority (FAA). The authority has 45 days to respond. Even if that is not satisfactory or the applicant does not receive the information sought from the FAA within the specified time or information is denied, then the issue is pursued with the CIC. And here lies the catch. No time limit has been fixed for the CIC to pass an order in any case. Gandhi strongly feels that there should be a time limit; otherwise the commission’s role is diluted. “The whole idea was that the commission should deliver [its order] in some reasonable time. To my mind, the commission should be given not more than three months to dispose of the matter,” he says. He suggests that every commissioner should dispose 6,000 cases a year, just like him. “Currently, the disposal rate is 3,000-3,100. They are disposing of half the possible number. Therefore, pendency is building up. Pendency can make RTI dysfunctional. In RTI we cannot expect receiving orders a year or two after the case is filed,” he says. Agrawal, on the other hand, feels that a fixed time limit is not a practical solution. As it is, the commission is struggling with a huge backlog. If a time limit is fixed, some of the petitions may get hearing years later, he explains. In the last couple of years, appeals and complaints are being increasingly rejected. They are simply not being heard. The CIC annual report of 2015-16 shows that public authorities rejected 6.62 percent RTI applications (though the number was less than 8.39 percent of 2014-15). Around, 47 percent of the 9.76 lakh RTIs were rejected under various clauses in Section 8 of the RTI Act, which deals with any information that affects the sovereignty and integrity of the country. One percent of the RTIs were rejected under Section 9 (private copyright). But a large proportion of RTI applications were rejected citing ‘others’ reasons. It is the role of the CIC to monitor the reasons for such rejections. “When I was a commissioner, I got the analysis done. The rejection rate was no more than four percent. One should always hear the petition. It gives some basis to start with the proceedings,” says Gandhi. But one of the main reasons cited for rejection by CIC Mathur is poor drafting of applications. Batra agrees. “Rejection of cases is a matter of concern. Even if an application is rejected on the basis that it is not filed properly, isn’t it important then to create awareness on RTI? But this is not happening,” he exclaims. The reduction in the rejection rate in 2015-16 should be welcome, but there is something more than meets the eye. The dip is possibly due to the decrease in the number of government institutions registered with the commission. In 2012-13, around 2,333 government offices were under RTI’s ambit. In the last three years, the number has come down to 1,903. However, in the CIC’s 2015-16 report, there is no mention of the number of offices that did not register with the CIC. According to an analysis by the Commonwealth Human Rights Initiative, more than 400 government institutions have not registered with the CIC despite concerted efforts. As per the provisions of the Act, the decision of the CIC is binding. It is not merely recommendatory in nature and has to be followed as per the law. The commission also has the power to impose a maximum penalty of Rs 25,000 on the public authority. But in case of persistent default by the PIO, the commission can only recommend a disciplinary action against him/her. It cannot remove or suspend the defaulting PIO. The final action can only be taken by the concerned public authority. Also, many RTI activists believe that some PIOs are expert in finding ways of not providing information. “PIOs know that in the worst case, the case will return in one or two years. No immediate action will be taken against them,” says Gandhi. Moreover, Batra says that for the past few years CIC has stopped mentioning the name of the PIO or CPIO in its orders. “Why defend these officials on whom the onus lies of providing the information as per the Act?” he asks.